A massive fire has erupted at the Notre Dame Cathedral in Paris, causing significant damage to France’s landmark architecture. 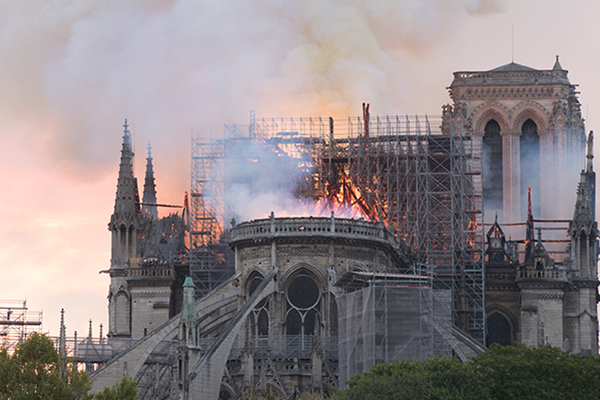 According to the French government and the municipal government of Paris, the fire was first detected due to billowing smoke from the cathedral’s spire at around 6:50 p.m. on Monday local time. Firefighters were dispatched to the scene, but had difficulty extinguishing the fire after it spread quickly along wooden structures installed near the cathedral’s roof for a renovation project. The spire and parts of the roof collapsed within an hour. According to media outlets, the blaze was contained as of early Tuesday morning. The police swiftly evacuated tourists and citizens, while no casualties have been reported as of yet. French President Emmanuel Macron canceled a scheduled public address to visit the scene. Macron vowed to rebuild the cathedral together with the French people. The cause of the fire is still not determined, but speculated to be related to renovation work.